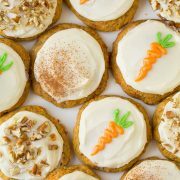 A soft and tender cookie that tastes just like carrot cake! And who can resist a rich cream cheese frosting like this? Preheat oven to 350 degrees. In a mixing bowl whisk together flour, baking soda, baking powder, salt, cinnamon, ginger and nutmeg for 20 seconds, set aside. In the bowl of an electric stand mixer fitted with the paddle attachment, blend together butter, granulated sugar and brown sugar until creamy. Blend in egg and vanilla extract. With mixer set on low speed, add half of the flour mixture and mix just until combined, then mix in carrots, then mix in remaining 1/2 of the flour mixture just until combined. Scrape sides and bottom of bowl with a spatula to make sure everything is properly incorporated. Scoop dough out with a medium 1 1/2 Tbsp cookie scoop and drop onto baking sheets lined with silicone liners, spacing cookies 2-inches apart. Bake in preheated oven until set (they should still be soft to the touch though), about 11 - 12 minutes. Cool on baking sheet several minutes then transfer to a wire rack to cool. After 5 - 10 minutes of cooling on rack finish cooling completely in an airtight container so they don't dry. Once cool, frost with cream cheese frosting and top with pecans if desired. In a mixing bowl fitted with the paddle attachment, whip together butter and cream cheese until light and fluffy. Mix in vanilla and powdered sugar and whip again until light and fluffy (if slightly runny chill in freezer about 5 minutes then mix one last time). If doing the carrot decoration set aside about 2 Tbsp to ting green and 2 Tbsp to tint orange (I used a Wilton #2 tip for the green and #4 for the orange).